Call in the coast guard rescue unit and get to the stranded diver! Race to the harbor with the 4x4 Response Unit. Launch the coast guard rescue craft into the water after checking your gear, then scan the waves to find the stranded diver and his dinghy. There he is on the buoy! The dinghy is on fire, and what's that hanging onto the side?! It's another exciting day with the crew of the LEGO® City coast guard! Price is 30% below the initial Lego retail price, a € 8.99 discount! This comes down to 6.05 cent per brick. 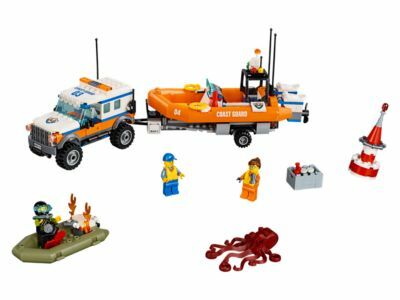 The 4 x 4 Response Unit (60165) Lego set is no longer directly available from the sites below. However, 3rd party partners of these sites might still have the set available. Alternate description Race to the rescue on land and sea!